"Wrap yourself in cozy luxury today. You deserve it!" Turkish Towels are all the rave right now, and we want you to get in on the trend! 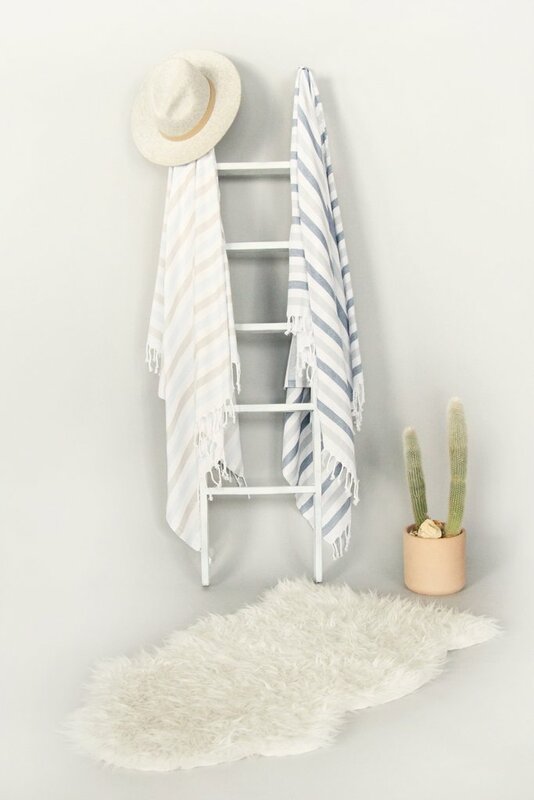 We picked up a line of Turkish towels from a Los Angeles based company, Smyrna Collection, that we are swooning over, and you are sure to love them as soon as you see them and try them! What is a Turkish towel? Why are Turkish towels so hot right now? What makes Turkish towels so great and different? What uses do Turkish towels have? How do you care for your Turkish towel? Who is Smyrna Collection and why did Sanctuary South decide to pick this company? Turkish Towels are hand-loomed with 100% Turkish Cotton. Turkish cotton is a long-fiber cotton that makes for fewer joins in manufacturing/looming. Fewer joins lead to stronger and smoother cotton, which makes for a very soft and functional towel. Turkish towels only become softer, fluffier, and more absorbent with use and washing cycles. Why are Turkish towels so popular and hot right now? Turkish towels have become popular in recent years for many reasons. The quick-drying, lightweight material help keep the towels from mildewing and becoming unusable so quickly. These towels are easy to travel with and store as their fibers are less; this allows for the towels to fold compactly. Besides the beautiful colors these towels tend to boast, those who use the towels rave about the softness and comfort. Although these qualities have helped to make Turkish towels popular, the qualities are also what make Turkish towels so different. How & Where can you use your Turkish towel? Turkish towels have so many different uses. We did not even realize all of the different uses until we dug a little deeper into this trend. The obvious uses would be to utilize the towel after a shower/bath or while laying out at the pool or beach. As we mentioned before, the towels dry tremendously faster than terry-cloth towels, making them great for a long day in the sun or drying off after a shower. Some other uses we found include: a picnic blanket/table cloth, a throw/blanket on your sofa or bed, a pillow/blanket while traveling, and a sarong/cover up at the pool or beach! Part of what makes Turkish towels so fabulous is the fact that they are hand-loomed. Towels that are made so specially and with so much love require a little more care when washing. Turkish towels are made for daily use, so they are very strong, however, a blogger from www.housetweaking.com recommends washing the towels on a cold gentle cycle and drying on low to medium heat. Smyrna Collection recommends a cold gentle wash cycle as well, but would suggest air drying if possible (imagine the smell and feel after you leave your towel to air dry outside on a spring/summer day!). Smyrna Collection is a luxury Los Angeles based textiles brand. They strive to bring a mix of California bohemian with a little bit of Turkey. Smyrna Collection designs each piece in Los Angeles, while the actual products are manufactured by artisans in Turkey. The company was established in 2012, and has since brought these great products that can go between home, bath, beach, gym, and everywhere in between! All of their products are hand-loomed with eco-friendly cottons. Their pieces are inspired to make the customer feel stylish, elegant, and comfortable. We chose this brand, because we loved their designs and that their products are made with 100% Turkish cotton, opposed to a blend of polyester & cotton that some larger companies use. What are people saying about their Turkish towels?